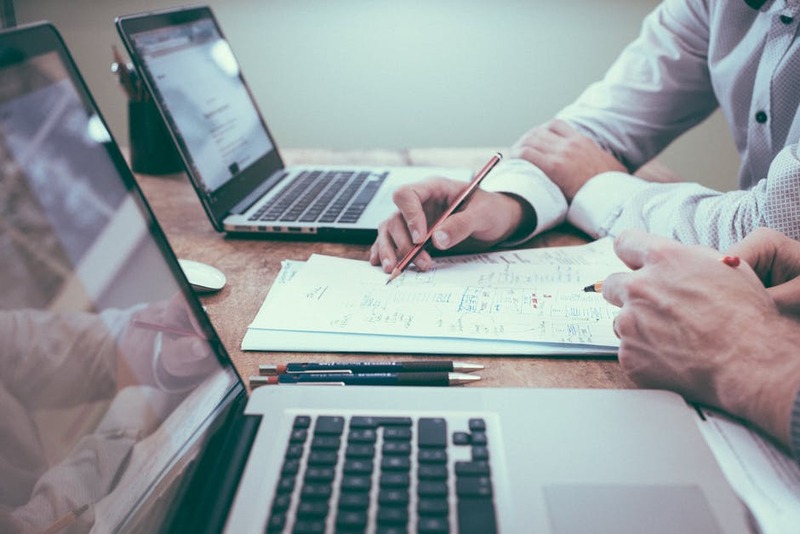 Creating and maintaining your financial advising firm’s website can be daunting- we know. Between selecting the images, choosing tool integrations, writing the content (and the list goes on and on), we understand the difficulty of developing a strong company site. That’s why we’re here to help. Purchasing ongoing articles or other content to keep your website fresh may sound like a good idea, but it doesn’t help reinforce YOUR message. Other people’s content typically doesn’t speak to your specific audience. By writing your own blog posts, articles, and insights, your potential clients will get to learn about YOU. You’ll also reap the benefit of improving your SEO, as you will naturally write about topics that are of interest to your target audience. Many advisors, like Brian Plain, have started their own blog linked on their website. Make sure you’re putting out content that is related to and can benefit your niche audience. If you aren’t sure where to start, we put together 10 great ideas for you. 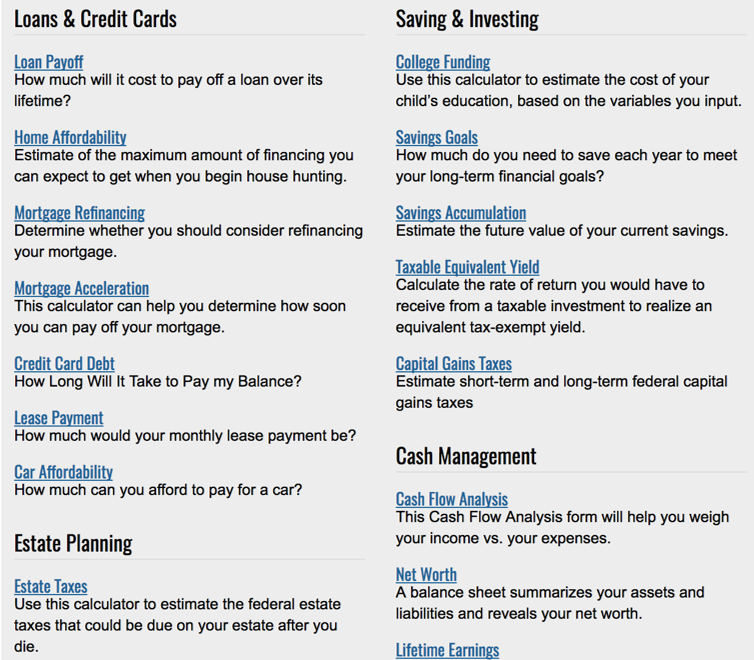 Our team has seen countless advisor homepages that look exactly like this. They say the EXACT same thing- no real message, no value-add, and nothing unique at all about what you as an advisor will do for your clients. When someone visits your site it has to immediately resonate with them. It needs a clearly articulated difference that sounds better and more relevant to your ideal visitor. If they aren’t intrigued, they’ll leave your site fast. This is the greatest foe of getting quality referrals too- it doesn’t just push away potential prospects, it underwhelms client and COIs who you need to refer to grow and sustain your practice. Make good use of headlines to get your value proposition across. What types of clients are you trying to attract? What services can your provide to them? Make it clear, concise, and attention-grabbing. Unless you have a very specific financial calculator for a very specific audience and reason, calculators are completely useless. Website manufacturers used to sell these as “cool” add-ons. Advisors typically bought in, but they’ve added no value. Shouldn’t you be their financial calculator? Get rid of them. Really, no one uses them. If you don’t believe me, check your Google Analytics. You are not Crate & Barrel or Target, who need to convey all of their various product choices online because consumers are making their purchase decisions right then and there. Rather, you and your service are the product. Therefore, your entire website should be about conveying your story, your philosophy, and your value, as clearly as possible. Keep it short and simple. Most people don’t want to feel like they have to read a book to understand who you are, why you are different and what that means to them. Less is almost always more when it comes to website copy. Say something compelling and then stop talking. Going back to point number one – using content provided to you by others can have its place. For instance, you might send a video to a new client to explain how you use (and how they can use) a tool like eMoney in their financial planning journey. However, that eMoney video is not going to sell your services for you. The most effective videos will consist of YOU talking to your site visitors. Twenty Over Ten Client WealthKeel features its own video on a main page of its site. 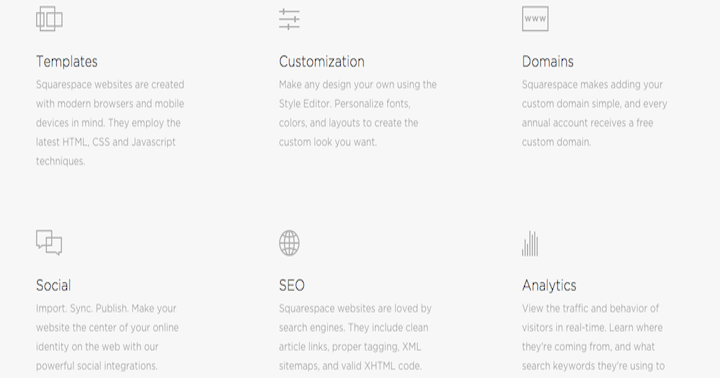 You should put your best and most compelling ideas on your home page. Longer home pages are effective because a visitor gets a good summary or snapshot of whether you’re worth investing the next 5-15 minutes of their time. If you hide your ideas, you may not gain their interest. For instance, this advisory firm has a whole page (that you have to click through 3 pages to get to) about the specific niche they serve. This should be on their homepage. It’s good to let visitors know how deep your expertise is, but doing so at the expense of a core offering or focus is not good marketing. The best businesses find a simple way to promote their best features and services. Focus on that ONE core area and a niche and the rest will fall in place. Claim a focus, then build value and confidence in that. 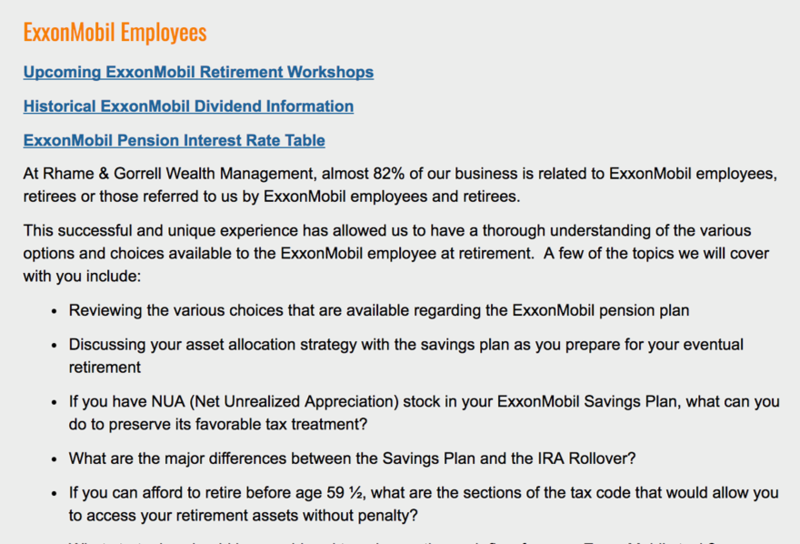 Twenty Over Ten Client Retirement Matters uses their homepage to explain its value. Have you seen this man below on the left before? We’ve seen him on so many advisor’s websites that we have a running joke in our office: he must be the world’s best-kept secret billionaire to need so many financial advisors. But in all seriousness, try and find some interesting or different photos. You can be original and still use stock photos. A much preferred photo option is a backdrop photo. A backdrop photo is one that focuses on an object with a blurred out background or a simple texture/horizon and doesn’t grab the visitors specific attention yet. The image should paint a nice atmosphere for your brand style. If you can’t take your own photos, try to look for more meaningful stock-photos. Don’t go with simple and generic ones – find ones that convey meaning about your firm. 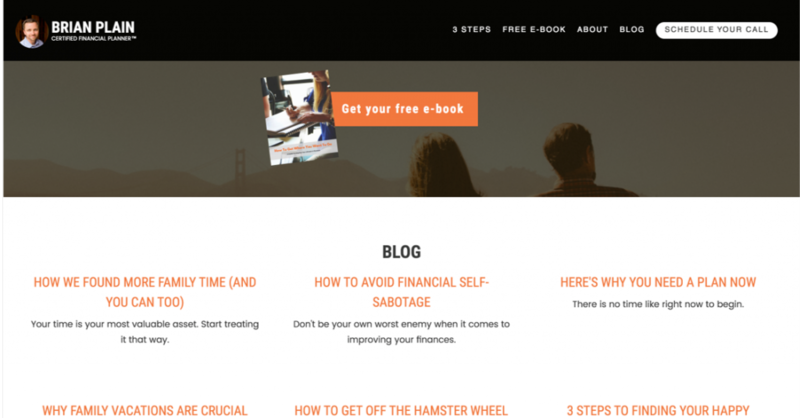 There are plenty of free resources and sites for great stock photos, like UnSplash. Check out the list of our favorites here. Most advisory firm’s websites have an average visit duration of just over 1 minute. Keep it simple and easy to navigate. Large navigation menus take away whitespace, aren’t mobile friendly, and scare away website visitors. There’s no reason you need to tell your message with more pages than this. 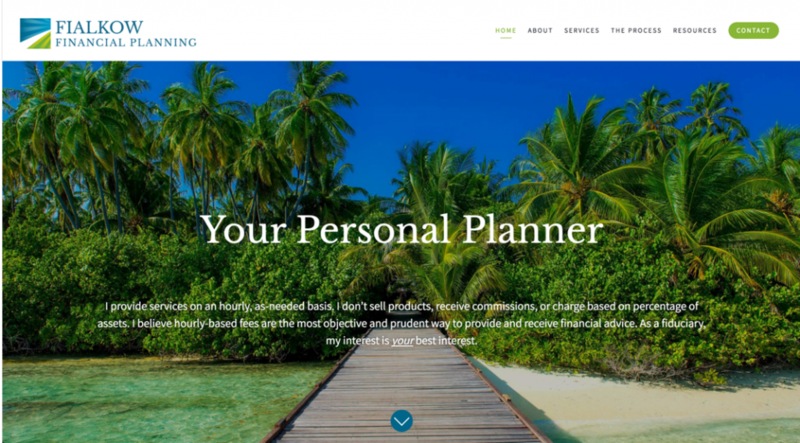 Twenty Over Ten Client Fialkow Financial Planning has exactly 5 main pages. The example below makes your eyes work hard. Again, you have a very limited amount of time to get your point across to site visitors. Don’t make them work hard. AT ALL. People will abandon a website very quickly if they are frustrated by any part of it, including difficulty reading or seeing the writing. We know a lot of advisors have little to no experience in design elements. It can be hard to choose the right fonts, colors, and look of your site. We put together a design guide for non-designers that can help! Check it out here. Our internal research shows that for most advisors, about 30-50% of all their website traffic comes from mobile and this stat increases month over month. This is no longer an option, your website MUST be mobile-friendly. In fact, if it’s not, Google will penalize you in the search engine rankings. Many website providers get this, but it’s always a good idea to test your site on multiple devices. Google even has a tool to help you determine if a web page is mobile-friendly– just enter the page URL and run the test! 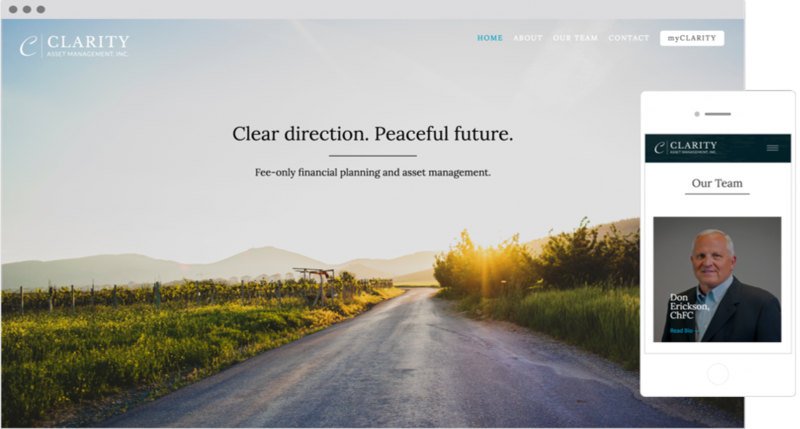 Twenty Over Ten Client Clarity Asset Management‘s website transfers seamlessly from desktop to mobile. Again, don’t make it difficult for people to decipher your message. This example shows how distracting it can be when you have too much going on. Once you’ve created your brand, you should stick with the color scheme developed by your branding expert or logo designer. A website palette should consist of three primary colors and one or two background colors. Our design guide can help you with this, too! Make it as easy as possible for site visitors to check out your social media pages. After all, we inherently understand that social media is where brands and companies are more “relaxed,” so we can get an even better feel for who they really are and what they stand for. Even further, make it as easy as possible for readers to share your blog posts with direct “share” buttons. Twenty Over Ten Client Bennett Financial Group uses social buttons for easy access to its social media platforms.